What a great time this past weekend! 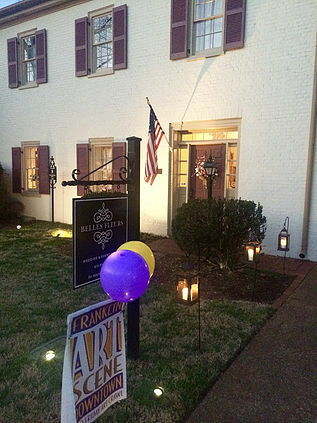 I was truly blessed and honored to be featured at Belles Fleurs in downtown Franklin, Tennessee. Hello to all of you who I met at the Art Crawl. SO EXCITED to be friends! If you haven't already, please make sure to follow me on Instagram and Facebook. Drop a note to check in! Would love to hear from you. It's always fun for me to travel to a new town. I LOVE exploring the area and always hopeful to snag a few pictures for paintings. Sometimes a new series even blooms. My heart was refreshed after this trip for the series I already have in the works that will make its debut in early Fall. If you haven't been to Leiper's Fork yet, it is a must go! What a charming town with art everywhere. From their stores, to the front yards and backyards, and everything in between. Fire pits at every store and S'mores fixings set out for their patrons! How fun is that? I have found a new artist as well. Well, he isn’t new...just new to me. David Arms. Can I just say the time spent in his gallery/shop was in tears, so moved by his paintings. Not only is the detail stunning, each of his paintings are subtly yet deeply profound. I found I identified with more than one because of the deep care and consideration that was so evidently placed in each piece. Every so often this happens. An artist deeply touches my heart and soul. Usually, it is because I have had the honor of meeting them and enjoying conversation. But it is a rare thing when an artist can capture your heart from his work itself. It speaks volumes. Makes you wonder about the creator. Wish for a moment of his time. Just to be refreshed and have wisdom imparted from someone who sees the world through different eyes. I learned much from Mr. Arm’s paintings themselves that day. About being an artist, faith, and life. About slowing down and waiting. Things I will treasure for a long time to come. And SOMEDAY I will own one of those gorgeous pieces. A new favorite indeed. And the link to my favorite. :) What’s YOURS?